Offered in this lot are four game used bats. 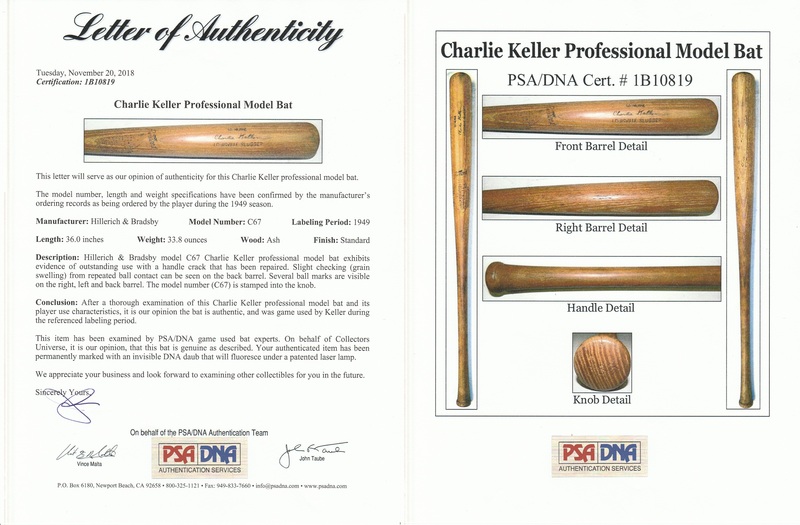 The first bat was used by Charlie Keller during the 1949 season. This Hillerich & Bradsby C67 model bat displays excellent game use and has a slight crack in the handle. There is slight checking or grain swelling from repeated ball contact on the barrel. The model number “C67” is stamped on the knob. 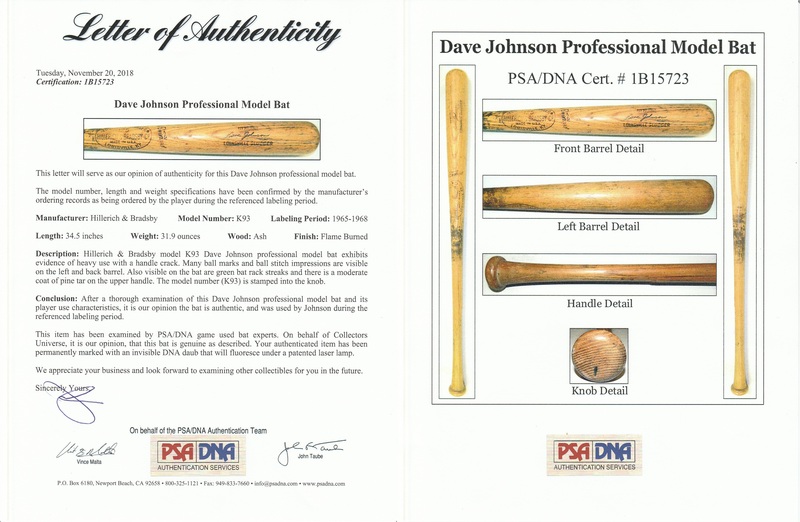 This bat comes with a LOA from PSA/DNA (1B10819). The next bat was used by Dave Johnson during the 1965-68 seasons. This Hillerich & Bradsby K93 model bat displays outstanding use with a crack on the handle. There are ball marks and green bat rack streaks present on the barrel. Johnson’s number “1” is hand written in black marker on the knob. 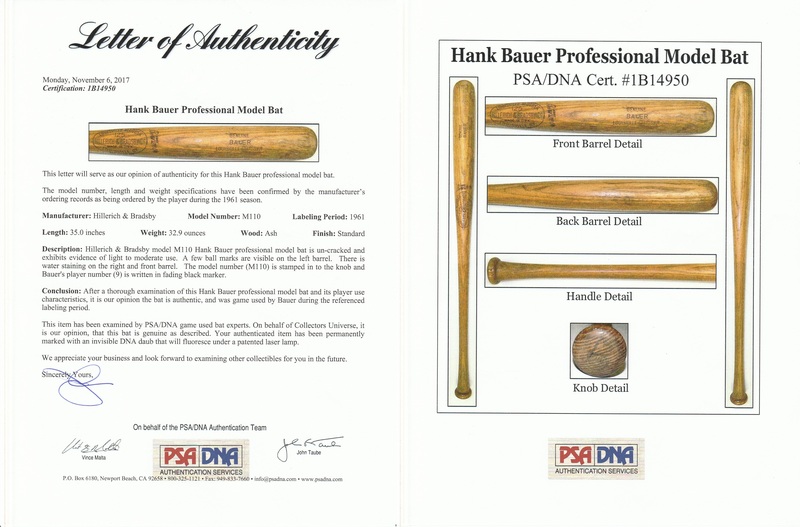 This bat comes with a LOA from PSA/DNA (1B15723). The third bat in this lot was used by Hank Bauer during the 1961 season. This Hillerich & Bradsby M110 model bat displays moderate game use and is un-cracked. There is water staining on the right and front barrel and the model number “M110” is stamped on the knob with Bauer’s number “9” hand written on the knob in fading black marker. 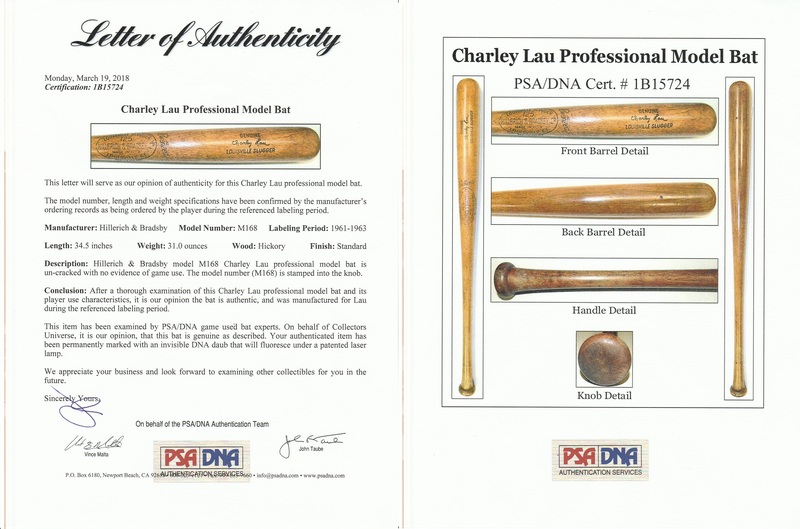 This bat comes with a LOA from PSA/DNA (1B14950). The final bat in this lot was used by Charley Lau during the 1961-63 seasons. This Hillerich & Bradsby M168 model bat does not display any evidence of game use and is un-cracked. The model number “M168” is stamped on the knob. This bat comes with a LOA from PSA/DNA (1B15724).